Tony Bellew has defeated David Haye in eleventh round after Haye’s corner threw in the towel. David Haye looked to have injured his right ankle midway through the fight and could hardly balance himself but decided to kept fighting but eventually ran out of gas in 11th round as Tony Bellew completed what was his career defining win over arch rival Haye. David Haye started with rash punches and never looked in control of his body let alone the fight but still he was winning on most people’s scorecards by first 5 rounds. Than came awkward fall in round 6 and he looked to have injured his ankle. From than on it was always going to be only one result as Bellew kept punching (not convincingly) but enough to win the rounds. David Haye and Tony Bellew are set to square of against each other on Saturday night, 04 March 2017 at London’s O2 arena for highly anticipated heavyweight clash. SkySports will broadcast the fight live in the UK via their PPV service “Sky Box Office”. The build up to the fight has been controversial but great to say the least combine that with a decent undercard and I expect this to do pretty well in terms of PPV numbers in the UK. 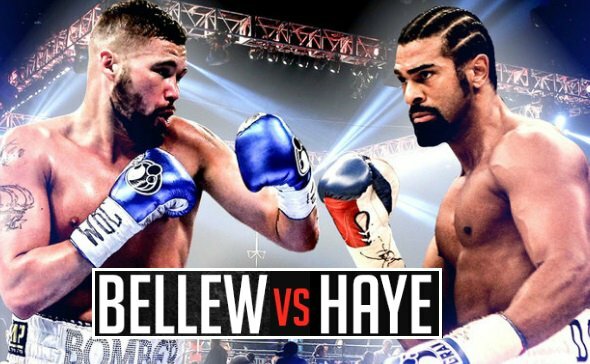 The main-event between Haye vs Bellew won’t start anytime before 11 p.m uk time and if you missed the live action, you can always tune in here for highlights and fight results after its all done and dusted. David Haye vs Tony Bellew Official Weigh-in Highlights: Both Haye and Bellew hit the scales on friday afternoon ahead of their much talked about heavyweight clash. Haye came in heavier of the two at 16st 9oz while Bellew made it to around 15st 3lbs 8oz. Haye obviously looked in great shape and mocked Bellew of under prepared going into the fight. David Haye was in buoyant mode during the official weigh-in where he hit the scale at 12 pounds heavier than Tony Bellew and looked in much better shape. It was a eventful weigh-in as expected with both fighters shouting their mouths off at each other and security had to jump in to keep them coming to blows during face-off. Its all setup for a grand night of boxing, maybe not in terms of quality but sheer entertainment value for both die hard and casual boxing fans. The fight night coverage starts at around 06:00 p.m uk time on Skysports 1 with preliminary fights but the coverage goes to PPV encryption at 7 p.m when undercard fights get underway. If you are in the UK, you can buy the PPV priced at 16.95 gbp while US viewers will able to catch the live action on showtime.